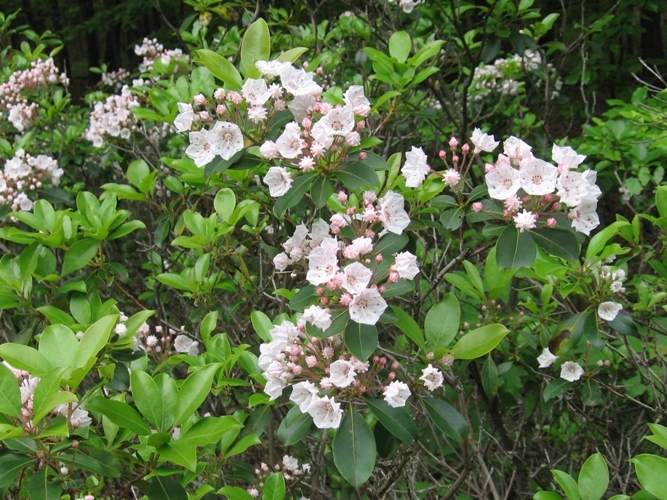 Kalmia latifolia.M. B. Gargiullo (2009). Kalmia latifolia is an evergreen shrub to 3 m tall, often forming thickets; roots associated with highly specialized ascomycota ericoid mycorrhizae (Allen1991); evergreen. Leaves alternate, elliptic, shiny, 5-10 cm long, leathery, pointed at both ends. Flowers white-pink, petals fused in an angular bowl shape, 1.5-3 cm wide, in sticky-stemmed clusters at ends of branches, pollinated by bumble bees, rarely self-pollinates; blooms June (Rathcke 1988). Fruit a dry capsules, ca 0.5-0.7 cm wide; Sept.-Oct., seeds minute, winged, wind-dispersed. Habitat: Undisturbed, mature upland forests. Probably mostly cultivated in NYC. Usually prefers sandy or rocky, acid woods, north-facing slopes, soil pH 4.5-6. Oak forests, pine barrens. Tolerant of shade. Moderately tolerant of salt, drought. Intolerant of flooding and compaction (Hightshoe 1988). Notes: Foliage toxic but eaten by deer (Kingsbury 1964; Gargiullo personal observation).